Discover Aquaman's humble beginnings before he became ruler of Atlantis! Born as Orin to Queen Atlanna and the mysterious wizard Atlan in the city of Poseidonis, he was abandoned as a baby on Mercy Reef above sea level. To any other Atlantean, this would have been fatal-but Orin survived to travel the ocean until he was found by a lighthouse keeper and renamed Arthur Curry. 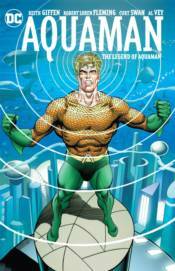 This new title collects AQUAMAN SPECIAL #1 and AQUAMAN #1-5 from 1989, in which Aquaman must face unseen invaders in Atlantis.